(Edit note, May 2010. I have revived this piece from the deep archives. I wrote this originally written back in 2007, and since then the popularity of instant ramen has continued to grow. Perusing a number of links related to the food stamp budget experiments, a popular cheap food item that keeps coming up is instant ramen noodles. Indeed, instant ramen has become a go-to food for many people on tight budgets, including students. As I wrote, even during my very lean (budget-wise) years I didn't try to fill up on instant ramen, since it has been ingrained for a long time in my mind - by my mother, by home economics and health classes in school in Japan, not to mention plain common sense - that instant ramen is quite nutritionally horrendous. Some people erroneously think instant ramen is healthy just because it's Japanese. (This has been brought up here before. (Ramen is a dish with Chinese roots, but modern instant ramen was invented in Japan.) It's possible also that instant ramen seems healthy, because it's noodles in soup - and all soups are hot and nourishing and good for you, right? Not quite. So what makes instant ramen bad? It's the manufacturing process. In order to create a dessicated, long-keeping noodle that cooks in a couple of minutes, it's deep-fried in oil. There are air-dried instant ramen varieties out there, but they take a bit longer to cook (though it's only about 5 minutes), and more importantly are not the real cheap kind. The 5-packs-for-a-buck kind are definitely not air dried. To make things worse, the instant soup mix has more fat in it, not to mention a lot of sodium , monosodium glutamate (MSG), preservatives and other mystery ingredients. You may not be one of the people who is sensitive to the effects of MSG, but the high sodium content is definitely something be wary of. Take a look at the nutritional information for Maruchan instant beef noodles for example, noting that they suggest a serving size of half a pack. When is the last time you ate just 1/2 a pack of instant ramen? A full pack, which is what most people have, is 380 calories, 126 of which are from fat, and most of the rest from white flour. Cup noodles (also called cup ramen, pot noodles, etc.) are just as bad. The rather healthy sounding Nissin Chicken Flavor with Vegetable Medley have 290 calories per 1 cup serving, which come almost exclusively from fat, white flour, and sugar. And really, how satisfying is a cup noodle? Now, I never said that you have to avoid instant ramen entirely. I don't believe in totally banning certain kinds of foods from your diet, since that leads to cravings, which build up and build up until you cave in to those cravings - more often than not in excessive amounts. I eat instant ramen sometimes. I grew up with instant ramen - the brick kind was invented sometime before I was born, but cup noodles definitely were invented during my lifetime. I still remember the excitement I felt when I got my first UFO instant yakisoba - I mean, yakosoba in 3 minutes! Wow! Whenever I'm back in Japan, I love to roam around the aisles of konbini (convenience stores) where they always have the latest and greatest in instant noodle products. But you know, I also love potato chips, and Doritos, and even Pringles too. Do I eat them every day as a meal? Not on your life. Do you eat a bag of potato chips or Doritos as a meal? Do you let your kids eat things like that instead of lunch? Maybe you do, in which case go ahead and give them ramen too, but otherwise you may want to reconsider. In short, cheap instant ramen is junk food, on the same plane as potato chips. You might as well eat Twinkies or Cheese Doodles instead. Really. But, I like the convenience! If you like cheap, quick-cook noodles, you can try thin pasta like spaghettini or angel-hair (capellini) or vermicelli - they are made of refined flour too, but aren't deep fried in oil. You can also look for air-dried instant ramen noodles, which take a bit longer to cook (5-7 minutes or so vs. 3 minutes for the fried kind) and are more expensive. Not using all of the soup packet that comes with the noodles can cut down a little bit on the fat, and a lot on the salt. (But then again...what's the point of instant ramen without that soup?) But the noodles themselves are the main nutritional culprit. But, I add vegetables and stuff to my ramen! That makes it healthy! Does having a small salad with a bag of potato chips make the combination automatically healthy? But, it's warm and it's soup! That makes it healthy and homey and all that! But anyway, just because it's hot and soup-like, doesn't meant that ramen is good, nourishing food. One day in March when I was in Japan, my mother got a sudden craving for instant cup ramen noodles. Ever since having major internal surgery in January, she's been having all kinds of odd cravings, for foods she hasn't been eating for ages. She hadn't had any cup noodles for years, since she's usually very much into fresh, real food. Anyway, I popped over to 7-11 and bought a selection of cup noodles (of which there are so many interesting kinds in Japan) and we had a little cup-noodle fest. The cup noodles were okay (though we both decided that the classic flavors were way better than the new-fangled ones like White Stew and Seafood Miso and so on) but afterwards, we both felt pretty queasy. Just like that feeling you get after ploughing through a bag of chips, but considerably worse. This got me thinking about why we eat junk food like this, knowing we will feel bad afterwards. Do they really taste so good that they are worth the sick feeling later? Or is it some kind of addiction thing, to all that fat and salt or sugar mixed together? Apparently some people lack the ability to read. Did I ever say that you should avoid eating instant ramen altogether? No I did not. I've said repeatedly that I eat instant ramen on occasion myself. And of course it's entirely up to you as to what you eat. Submitted by maki on 2010-05-06 21:05.
i am living in tokyo now and i love your website! i was wondering if you know anything regarding the nutritional information of ramen in a ramen shop. i know the recipes vary by shop, but i've had trouble finding any nutrition information online. if my brother had his way, he would eat ramen every day, but my japanese host-mother always told me how unhealthy it is. any comments? thanks! Eating raman in a raman shop is healthier than eating it from the package, or cup. tho it is still unhealthy, high amounts of fat and salt are still included tho the fats tend to b more natural...aka from REAL chicken,beef,etc. how is toyko? i was planing to go visit but idk with all the earthquakes going on in japan, i was wondering if earthquakes hit throughout the entire japan or certain parts? no matter where you go there are natural distasters. you have to expect that. although Japan does have a lot of quakes, the buildings overall can handle them quite well. better than most US buildings. don't let the quakes scare you. take advantage of the chance to travel to this amazing land...you might get stuck here and spend your life here! I have been here about 17 years and still prefer it to the states now. you might be interested in this article, about how ramen has basically become the national dish of mexico, so much so that the nickname for mexico is "maruchan nation." i once saw an episode of a television show where the host went to a mexican/us border town, and all around the border on the mexican side, he found empty cup noodle styrofoam cups strewn about. sheesh. bad for you, and bad for the environment, but handy when on the run, no matter where. ...or swim... Is Cup Noodle now the food for the on-the-go illegal alien? I live in mexico and know no one who eats this crap... aren't stereotypes just awesome? blame border patrol for the garbage. the soup is where most of the 'bad' things enter: first of all it's usually quite salty. Also it can be rather oily, since a proper ramen soup is made from pork bones and other things. A lot of places add a bit of flavored oil, often sesame oil based or lard based. Then there's the toppings, which again can vary. If it's all-vegetable based that's one thing, or if you are adding a lot of slices of fatty pork... etc. But of course, real ramen is, if prepared well, delicious. So I'd never totally avoid it! But it might not be such a good idea to live on it either. So now I am wondering if my favorite brand of Chinese Noodles, by China Bowl, is deep fried also. Do you happen to know the brand, and if it is deep fried? They do cook up rather quickly, so I am guessing that they are. The package is not marked as ramen noodles, though. Everytime I read your blog(s), I am amazed at the wealth of information you give! Keep up the great work, and be healthy! Thanks and many of God's blessings to you and yours! I'm not familiar with the brand, but if the noodles are dried, check to see if they have been deep-fried to dessicate them (you can tell that by looking at the list of ingredients and see if oil is among the first listed). If so they are just as unhealthy as cheap instant ramen noodles I'm afraid. If they have been air-dried they are a bit better, though they're still made of white flour which isn't the healthiest thing I guess. If the noodles are soft, most likely they are either uncooked/raw or steamed. hello maki. may i know your surname, because we need it in our thesis. we need the surnames of the people who wrote an article of our topic in our research paper. please reply soon. thank you. actually, cup noodles i believe are only 290 cal~ each. they aren't "2 servings per cup," and they are in fact 1 serving per 1 cup noodle. If there is anything worse than instant ramen, I think it may be instant yakisoba. The last time I had it, I unwisely checked the calorie count while eating and saw that it was well over 1000. Considering that it weighed less than a small onigiri, you don't even have to check the fat or salt content to know that something is very, very wrong. The reason it made you and your mom sick is the same reason you eat it: one of the main "mystery ingredients" in instant ramen noodles is TONS of MSG! I'm sure you're familiar with it...but that umami flavor, it keeps you coming back for more (by design...) and it's notorious for various adverse bodily reactions. Hmm. I'm not so sure MSG is necessarily to blame. As far as I know, no empirical link has been found between MSG consumption and illness. MSG is also present in a lot of other foods, and it's hard to imagine that the human body could possibly be allergic to something found everywhere. A lot of people who claim Chinese food makes them sick (because of MSG) don't seem to have the same issues with McD's/Burger King/KFC food, even though they use a lot of MSG too. Hmm, why is that? Actually I find more western foods have it than people realize. I can't eat western foods such as Doritos Chips. The msg in it gives me a migraine, note not a headache a migraine. Cream of insert name soups are like an instant migraine inducer too! I never really thought ramen tasted that good, but I think I've only had the 'wrong' kinds. Convenience has never been reason for me to buy/eat certain things. I actually don't even buy other kinds of (non instant) noodles in the shop anymore. Since I've learned to make my own udon thanks to your site, those are the only noodles I want to eat. Well... I would like to make my own soba as well, but I think that might be too difficult (the cutting part). I did find some chuka soba noodles that had directions on the back for making them in to ramen, yakisoba, or hiyashi soba...are these the normal yakisoba/ramen/etc noodles? I think I saw some similar fresh noodles (possibly also chuka soba) but I haven't had a chance to try either of them yet. I might be strange but I'm actually not a fan of ramen, either instant or real ramen....though I've only had hakata ramen fresh. I found it a bit too umami >_< I love yakisoba though. You found it too "umami?" Wait. You didn't like the ramen because it too delicious? Do you not know what umami means? The word "umami" is a word coined by Professor Kikunae Ikeda from the Japanese words "umai" (delicious) and "mi" (taste) to specifically describe this taste that can be found in fermented and aged foods, fish, shellfish, cured meats, vegetables, and green tea. . The way that it is used world-wide is to describe a savory flavor (that is now recognized as the fifth basic taste) that is scientifically described as the detection of glutamates and nucleotides. More specifically now, umami represents the taste of the amino acid L-glutamate and 5’-ribonucleotides such as guanosine monophosphate (GMP) and inosine monophosphate (IMP). To put it simply, an umami flavor is, universally, an umami flavor that there is no other word for. I've even heard some Brits and Aussies talk about how their marmite and vegemite, respectively, have an umami flavor! So the word wasn't misused at all, especially when talking about instant ramen. MSG can give an umami taste (since it's a glutamate)... and we all know that instant ramen is packed with MSG, so some can find the umami taste or instant ramen to be unbearable. I never buy the instant ramen in the US but when I go to Japan or when my mom comes to the US, we always stock up on this brand of ramen from a company called co-op. My mom says that it is not as bad as the other ramen. But I still try to eat it only occasionally. My roommates and I had ramen feasts and Totino's parties all the time in college...because we were so very poor. XD Sometimes I liked using the packaged seasonings, though usually just added my own spices to the boiling water with a bunch of veggies and an egg. That's the one thing all college students need to know, dropping an egg in your ramen makes it 100x better. In theory I could have just bought ramen noodles for nutritional value's sake, but Maruchan is oh so cheap...and this is coming from the girl who ate bagels and a small bag of Flamin' Hot Cheetos for lunch every day in high school (I still indulge myself occasionally on that one when carbs and I are on speaking terms). 2. Have no other food lying around the house and too hungry to go out to buy some. It's such a national thing that a lot of my friends bring it with them when they go studying overseas just to help with the homesickness. BUT everyone I know knows that its not something you can eat often, cause apparently eating Maggi Noodles too much makes your hair FALL OUT and screws up your health. It's the tons of MSG they put in to artificially flavour the thing, the main reason why you always feel so thirsty after drinking the soup. Instant Ramen and Cup Noodles is based on the same principle. Hey, I know "Maggi Noodles" as well. Those are widespread in Asia. When I was a kid vacationing with my parents in Sri Lanka I surely ate them 3 times a week. My aunt always had some packages in stock. That stuff was incredibly salty, with an penetrating aftertaste. Pure chemistry soup!! And the noodles are not that great too, they r mushy..very fast. Just said. When I was little my grandmother used to let me crush up the package ramen and pour the seasoning over it in a zip lock bag...and then I would eat it just like that. SOOOOOOOOOOOOO unhealthy it makes me cringe to think about it now. I try really hard to get my family to eat healthy now, and I am a health-food lover. They aren't too keen on Japanese food just yet, but I love it. I love your website and I check it almost every day to see if you have posted something new. Japanese actually package dried flavored ramen noodles like that as a snack...and if you wish, you can cook it too! real popular with the youngins. I agree completely with this post. I kind of wince when my boyfriend thinks that adding an egg and vegetables will make his instant noodles any healthier, and wince twice when he downs all the soup. As a child I probably had more than my fair share of instant noodle meals. However, after getting diagnosed with IBS and being forced to eat healthy (and subsequently eating better), eating instant noodles again was...an interesting experience that left me slightly queasy after. This was eating the 'healthy' type without added MSG. I think liking all that salt and oil is quite an acquired taste; sadly it's probably an easily acquired taste, as now that I am well and eating oiler foods instant noodles are tasting less and less strange. Personally, I find that a lot of thin Chinese wheat noodles cook up fairly fast - made from refined flour, they cook in a matter of 5 minutes. And if you take another 10 minutes to make a simple ground pork, bok choy/tasty-in-soup-green-of-your-choice, green onion, sesame oil, and soy sauce soup base you've got a delicious meal, healthy and free from weird additives. All done in 15 minutes! 6 ingredients! 15 minutes! That's only 12 more than instant noodles! 10 more than 'healthy' instant noodles! Less than 10 more if you count variations that include an egg! And did I mention tasty? And you can omit the greens (not not the green onions)! Or take out the ground pork and use dashi stock to give it umami flavour instead! Or add small dried shrimp instead of dashi/ground pork! Or whatever! Or add chili garlic sauce! Or add miso? (!) Or canned mushrooms! Or ...stuff! And in the long term, this is not much more expensive than real instant noodles! It's more filling! And tasty! Did I mention healthy? And I'm sure there are a billion more simple noodle dishes like this that are easily cooked up and tasty! Though to be honest as a child I often preferred instant noodles very slightly over these healthier simple noodles, *cough*, but they are still damn tasty noodles. So er, yes. I care deeply about simple noodle dishes. I'm kind of curious there's a Japanese equivalent to these noodles, really, because they're so simple some form of them are probably...everywhere. Kinda funny that so many people here had the same idea. I too liked instant ramen, but was always bothered that it had so many chemicals. And because of the weird artificial taste I would only eat it now and then. So I started like you to buy nice quality noodles, and add the ingredients myself: No chemicals, some vegetables, good spices and sometimes a little meat or tofu. It does take only some minutes more, tastes better, is good for experiments and for using leftovers. And when adding two fresh tomatoes in it: it's the bomb! I'm not convinced that the packaged junk is actually cheaper in the long run. If you buy a good sized batch of noodles and a bunch of good-quality canned broth, and you should always have on hand add-ins: left over meat, veggies (especially green onions), and of course basic spices, your cost shouldn't be that much more. (I need to do the math). Companies rely on people falling for the "time-saving" ploy. They assume you don't know the context of multiplexing. You put the stuff on the stove and you do something else, like check your email. You chop up something and toss it in, and then you respond to a couple of emails. You are only "saving" the time if you just stand there watching the water boil. Thanks for the heads up Maki! I could have thought of it myself actually... . I rarely make these instant ramen anymore. Most of the other dried noodles are equally fast cooked, and a (soja sce) bouillon doesn't take that long either! Let's chill a little bit here. Instant ramen "...very, very bad for you." I don't think so. Arsenic is very, very bad for you. Cigarettes, plutonium... how many 'verys' are needed. The title does not match the body of this post. The take-away from the [well written but not so well titled] post should that instant ramen is not not nutritionally complete perhaps high in sodium, there may be healthier alternatives. Convenient? Cheap? Quick? Yes, yes, yes. The alternatives take a more time? Yes. Is it worth the investment in time? Yes, I believe that it is. Well I think you are splitting hairs here. I kept the original title with the 'very very' just to emphasize that ramen is not everyday healthy food - as it often seems to be marketed and portrayed. The original impetus for writing this post 3 years ago was seeing how many families on food stamps were heavily relying on instant ramen. And I know that many college kids, both in the U.S. (not sure about Europe yet) and Japan eat instant and cup ramen for everyday meals too. And I'd categorize arsenic as 'probably lethal in heavy enough doses' and cigarettes as 'potentially lethal if you keep it up', if you want to put things on a hyperbole scale of some sort. Does instant ramen cause cancer? Probably not. Is it something people should eat several times a week? Probably not. Is it sold as something you can eat every day? Yes it is. I guess I am lucky in LA & OC. ( California ) there are so many Asian markets where you can buy fresh Chinese or Japanse noodles. We have so many great choices. I make my own Ramen. I love Ramen. I do not eat instant noodles. The sodium is over the top, Just not healthy. In Cosco you can get a big box of instant Ramen ( 24 ) for under $7.00 that tells you there is no nutritional valve in this process food. It's like micowave popcorn that is so unhealthy compare to the kernnals you pop on the stove. It may take a few minutes more but it well worth the trouble, health wise. You are what you eat! I love this blog because I lived in Japan for many years. I lived in Tokyo for one year and Kyoto for 3 years. I fell in love with Kyoto. The food there is very healthy and fresh. Of course you have choices. Thanks for the postcards from Kyoto. I been to a few places mention. Brings back great memories. I love going to the old traditonal establishments. I was very lucky to have friends in Kyoto, who are proud that their families have been there for generations and they take a deep pleasure to show the old establishment and artisans. I had the most wonderful 3 years in Kyoto! You should write on how people who are artisans become the treasures of Japan! Very talented people with traditions in crafts that might die. No one to follow the pain taking workmanship. Kyoto has a few people who are treasures of Japan! ( most are in their 60 ~ 80's ). Thanks again for all the wonderful information you post. Microwave popcorn is exactly the same as ordinary popcorn, but in a paper bag and sometimes with some added flavouring. It's stupid stuff, but only because they charge you an arm and a leg for the same stuff you can buy for a few cents. Popcorn by itself is relatively healthy, no matter whether it's made in a pot or in the microwave, but when you start pouring butter and salt or toffee or whatever else you want on it it becomes unhealthy - again, no matter whether it's cooked in a pot or the microwave. Love the picture (and your site). My six year old is a big fan of ramen (maybe we watch too much Naruto?) but knows it is a special treat. Even though I'm also a fan, I shudder when he puts Ranch dressing in it. I used to eat ramen all the time in High School, I would make it in the morning and pop it in a thermos for marching band competitions or for a late dinner. (I think most of it was trying to express my obsession with Japanese culture, and it was literally the only Japanese "cuisine" I could find in our small town)I would eat it straight- full pack of noodles, full pack of seasoning. Right now I'm studying at Waseda in Tokyo (grad school) and I am amazed by all of the noodle joints around here. Udon, soba, etc. but of course the most ubiquitous is the ramen shop. They are literally everywhere! And cheap too, 200yen for a full bowl of the stuff. Your website is helping me avoid the college food trap. I'm cooking most of my meals in the dorm, and to afford it, I'm trying to cook as "nihon-teki" as possible. Thanks for keeping me fed! I once spent a couple months eating tons of instant ramen. But I quickly got so sick of it I couldn't even think about eating it for years. Now I just have it on a rare occasion if I really want it. It really doesn't take that much longer to make some more real, nutritious food. Instant ramen is a main staple for us. Not because it's nutritionally good, but just because it provides needed calories in our diet. In season fresh fruits and vegetables are also cheap, but not high in calories. And half a block is 190 calories, not 300, so I have no qualms about eating an entire package of it myself, thus making one meal 320, not counting any vegetables or egg I add to my noodles. I just visited south east Asia - it's pretty common to see food carts that sell noodle soups... and they'll also make instant noodles for you if you like and add toppings. Er, we practically eat it once a day in my family, except we do it the south east Asian way - with lots and lots of fresh herbs, vegetables and maybe a bit of meat, until it's a pretty complete meal. I don't add the oil/fat part, just the stock powder, and I also put a bit of extra seasoning in it. Or I use my own homemade stock. So in the end I guess it's just like using dried noodles and making your own stock out of stock cubes or something, but faster, it only takes 5 minutes. Not sure if that's better or worse. It's probably really bad, but we're all in good health so far. At my school in Australia it used to be you could buy packets of instant noodles at the tuckshop. We'd crush the noodles in the bag, add the stock powder, and eat it dry, like chips. Very often, people eat instant ramen and cup noodles for facilitate.But that is really bad for body.I do not eat instant noodles now. I will rephrase "My Home - My Castle" to "My body is My home and My castle is My health". Depending on how you take care of your home (body) will affect your castle (health). And no doubt, one of the major concerns of an individual should be their health, but unfortunately health is one of the things that is given less attention and was also taken for granted. Health is wealth, good health gives an individual a lot of benefits, a person could participate actively in society and can perform responsibilities effectively. Having good health depends on the lifestyle a person has, and what Online Diet Plan your choose. Interestingly in the UK, brands such as Pot Noodle and SuperNoodles introduced the concept of instant ramen in the 1970s and subsequently defined the 'impression' the nation has of these foods. Both are VERY much considered junk foods and are often a by-word for bad food. There is no nutritional or health benefit associated with them at all!! Funny isn't it? When you made the instant and/or modern version of something healthy, it became unhealthy. Same like fusion sushi. Maki, have you ever heard of a magazine called "Cook's Illustrated"? They recently published a recipe for raman noodle soup made from scratch that is really delicious and much healthier than the instant broth. I'm surprised people are actually angered by this post. From where I'm from, everyone knows that instant noodles are unhealthy. It is junk food and a snack, not a staple for sure. I grew up eating Oodles of Noodles.Pork flavor ruled . We would go to NYC chinatown and find awesome flavors in the basement of Kam Man super market. As you get older,you start to read ingredients...my mom couldn't eat a lot of sodium anymore,and as you go on discovering things you ignored as a kid,you begin to realize just how bad this stuff is for you. This includes things like instant mac and cheeze,chef boy ar dee and the like...I mean a lot. So if people get are getting mad,they *really* need to read the labels. MSG is now illegal in the usa....yah.Just like transfats,and it looks like high fructose corn syrup is about to go that way too. The general rule for sodium for a day for an average adult,is 2000 mgs,or 2 gms. Read a label of a canned soup. Most have about 9000 mg per serving,2 servings per can. Eat that for lunch,then try to eat something else for dinner or breakfast,with sodium,as its in EVERYTHING,you go over the limit. Do that regularly,and you end up with hypertension by the time your 40. Its very hard to do. The commercial brands ,of EVERYTHING ,are so full of sodium and/or chemicals,you might as well just down half a bottle of MSG and a box of corn starch. Typo ,I meant 900mg per serving,not 9000,,sorry ! Funny, though, because one time I asked a lunch lady why they stopped serving their awesome cookies, and she replied, "We aren't allowed to anymore, because they're not healthy enough." And yet the most popular lunch at the time was a Cheeto bag with a splash of fake nacho cheese inside the bag. Eaten with one's hands. Mmmm. Healthy. Oh, and I agree with your title. Instant ramen is very, very bad for you. Maki, how are rice noodle bowls for you? I can't eat ramen anyway, though I admit I ate a bit too much as a kid, but I do occasionally have rice noodle bowls when I need something to eat and don't feel like cooking. Do you know anything? Living in Asia is like living in instant noodles world! I am an instant noodles junkie... means I ate at least 2x a week! In fact I just finished a bowl before reading this post! I know about all the unhealthy stuff found in there but like any addicts, I guess it is tough to let go of something we love but knowing deep down they are really bad for us. Life is short, eat first and worry later! When I think about the way most college students eat, I shudder. I don't know how someone could go so long without eating any fresh foods! When I was younger, I remember my mother found whole wheat instant ramen that didn't use any MSG or artificial flavors ... they may still have been deep-fried, though. Anyway, they were pretty good but I'm not sure if they make them anymore. This was probably the Westbrae brand. Definitely a bit healthier. I don't think it's made anymore. I would add different vegies, cut back on the spice package and add my own spices, etc. It seemed pretty healthy, actually. I grew up eating the bricks of ramen. We were pretty poor and I often had to cook for myself so ramen was one of my main foods. I even had the perfect pot for a one brick serving. Now, I can't eat it any more. Once in a while I'll get a craving for it but it just gives me a tummy ache every time. I do think they taste great in that yummy junky kind of way though. I remember someone I worked with told me her daughter ate the cup of noddles type as a diet food. I nearly died. I was like you know that stuff is just as bad as junk food, right? She had no idea. The thought that soup could be bad for you, had never crossed either of their minds. No wonder her daughter wasn't losing weight. I love soup a lot. But it always kills me when people go on soup diet thinking it's healthier or something. Eating my Grandmother Italian Wedding soup maybe yummy but dear lord is it bad for you. When I go out to eat Japanese I almost always get ramen or udon. I love soup and love both "real" ramen and udon. At least with restaurant ramen you can say there are at least vegetables to at least balance it out a bit. I don't think I've ever eaten it with more then one piece of meat on top, though. Finally, someone isgetting the word out that insatant ramen is BAD, VERY BAD for you. Just reading the nutritional information on the package should be enough to getting anyone to think twice about actually buying this stuff. There isn't one "natural" ingredient in the stuff. It's all chemicals. And the sodium content...well let's not get me started. So "Thanks" and keep up the good work. P.S. I teach Japenese cuisine and your website is one of the best for information and good food. I heard this very recently, and I knew that ramen couldn't be as nutritious as other foods. However, when I heard that it was extremely unhealthy from other sites I kinda had that "Ehhh?" reaction, because it's just noodles and some salty package. That's not healthy, but what's so terrible about it? Now, knowing that it had been deep-fried, I have to thank you very much. I like to eat ramen on occasion because it's quick and it tastes pretty good. Now I know why it's so cheap. Seriously, thanks a ton. I will try to avoid it more often, but like you said, denying yourself something tasty forever and ever is unhealthy in itself. Ramen had been an on-occassion food and will remain so, if not even more so. hello its winter where i live, and one of my favourite things is a kimchi and vegetable noodle soup, ive been testing out different ways to make the stock and what noodles to use to make it healthier since i am trying to loose weight and not use the instant ones as a base anymore. what would you suggest for the stock to give it that spicy, savoury warm flavour? Ramen is one of those foods I know a lot of pregnant women love to eat, myself included in that bunch at times. I really want to know is what instant brands are non-fried and air dried only? Sometimes I get very little time on my hands to eat a lunch since I'm a teacher and my kids eat up my time on me. I love noodles but I'm so damn lazy I can't boil dried noodles and wait for it. The instant noodles are just so friggin convenient, cheap, and fairly tasty. I do pour out the broth to cut down on the sodium. 13 grams of fat for a meal is not that bad. And MSG? I live for it. Glutamates are nothing to be scared of. I use to eat 5 packs a day and 2 cup noodles a day. When you're poor what else can you do? I rather be alive living off of junk food rather than starving to death. Then when the budget wasn't so tight I started buying Hungryman TV dinners. They average from 720 calories to over 1,000. Usually with 50g of fat or more. I ate 3 a day for 4 months and gained 30 pounds. Where as I didn't gain any weight eating noodles. I started working out and after 3 more months I am back at my average weight. Yes, packet noodles on their own, as cooked by the instructions on the packet is bad for you. It's the same with eating a burger with fries, egg & cheese white bread sandwich, a hot dog, a bag of chips etc. It's a fast food so we don't (least I don't) expect it to be a healthy food. Especially when the soup base mentions MSG amongst other things I have never heard of. Ramen is better than eating other fast foods such as a super sized burger or deep fried meats or lots of ice cream. At least with Ramen noodles, you can add or takeaway some of the ingredients to make it less bad. My oriental family have been eating Ramen noodles for years but we change the way we cook it. You could buy a box of 30 for the same price as 10 carrots or 6 Daikon Radishes over here. Enough noodles to last you over a month! Instead of using all of the soup base, we only use half and substitute the rest with soya sauce or stock of our own - sometimes we completely leave the soup base out and put in fresh miso paste. The noodles are so cheap, we sometimes find it cheaper (as a young family) to buy them just for the quick cooking noodles. We often put pak choi, eggs, spring onions and other vegetables with the noodles. So eating noodles this way isn't as bad. In fact, you go to any restaurant selling noodles, they would use some sort of soup base of their own...some will use MSG in their mix. This accounts for the cheap kinds of course. So yes, Ramen noodles are not healthy because they are a fast food. Therefore, eat moderate amounts like you would eat chocolate, sugar or deep fried Chicken. If you do have them a lot...especially students who do not have time because they are busy revising or studying, add vegetables and use half the soup base. Or no soup at all, just boil and drain, then serve with soya sauce and sesame oil. I used to buy Westbrae brand ramen and it was quite a bit healthier than what is available now. I remember brown rice noodles and other whole grain varieties that were also vegetarian. What happened with this company? Apparently they're no longer making the ramen. I consider that a major loss! I found an instane korean soba noodle wich are so good and it's less cringe worthy then the normal kind ...I hope. if i pour away most of the broth is it still sooooooo bad? I buy some air dried noodles here that come in packages of 4 in 1. They cost 5 dkk, or rougly 0,9 dollars. The content of sodium and salt (NaCL) is of rougly 1g per hundred. I eat 0,5-0,75 pack, so it's around 700 mg, which is 1/3 of recommended max dosis. I don't each chips or stuff like that. The fat content in my packages is 0,9 per hundred. Sure, it's high on carbohydrates (70gr) and protein (16) gram. I almost always add 1 large spoon of chickpeas, 1 of corn, 1 egg and 2 small slice of boiled hellefisk. It tastes really good. I have this once a day. My daughter loves the stuff, but I only let her eat it maybe 3 time a year......really (just because its so bad for you). She really likes the taste of it. Does anyone have a recipe I can make that tastes similar? Doesn't have to be "instant" or anything. I can whip it up and take can take it to school in a thermos for lunch. Thank u! Excellent Research! And very very great points. No more Ramen for me, not worth all the chips, doritos and twinkies sick feeling. Thanks! Excellent article!!! Thanks for posting it. Don't worry about the people who complain - they're in denial. I still love instant Ramen but had NO idea why it was so unhealthy - your explanation makes sense. To make maters worse...you should try the way I love it. I got so addicted to my special way of eating it I would use two, yes TWO bricks of Ramen, and it it just about everyday. I love peanut sauce and didn't have any so I experimented with chunky peanut butter, shoyu, mirin and Huy Fong, Sriracha Hot Chili Sauce. My homemade concoction is SOOOOO good!!! (have you ever tried Huy Fong, Sriracha Hot Chili Sauce, by itself on a cracker? Mmmmm). I had to give it up, except for about once every 4 months, because I was packing on the weight even more. Now I have a 12 pack of Ramen, and the other ingredients, in the pantry that keep calling my name. Anyway...is there a brand, or two, of air dried Ramen you would suggest? I'm getting ready to make a pilgrimage to the areas largest Asian food store (it's time to replenish the pantry) and would like to find some. FYI, I have eaten pre-packaged ramen in Japan, Korea and now, China. I really can't decide which kind is the best; I just love the salt and the noodles. I understand how it is bad for you. I am very healthy and very active and very skinny. I've never had any major health issues. I eat ramen normally once a week or every two weeks. I eat one pack. Unless I am starving and then I can eat one and a half. I add vegetables and sometimes meat and I dress it up a bit normally. So, let's see, I can live FOREVER if if don't eat instant ramen, but us ramen eaters will die someday. Is that it. Got it. Good luck in trying to eat only what will make you live FOREVER. Me and my dad make homemade ramen quite often and although it is very simple it tastes great! Also doesn't take a lot of time. Being in Scotland, I don't think we actually have instant ramen here anyway but instant noodles are popular! Is it true that ramen noodles take about 7 days to digest in your stomach?!??!! I recently have came up with a really good ramen recipe but I am trying to stick to healthy food. I'm in college and my dad boughtme 4 cases of ramen. If I used wheat spaghetti noodles instead of the ramen packet and then used the pre-packaged spices to add flavor along with cayenne pepper and rice would it be that bad for me? I guess the real question I have for you is are the pre-packaged spices some sort of genetic freak of nature in a metallic package or are the flavor packets bad for you? You wrote, "Incidentally, I’ve gotten a fair number of angry emails and comments to this post over the years, as though I’m attacking a fundamental right or something." Sorry about that. Yes, even the slightest difference of opinion has become a "rights issue." Whatever I want to do is a "right." Like spoiled little children, we have a tantrum if we are questioned. Thanks, this post was very informative. I've been looking for something quick and cheap and I just got some new chopsticks, but before I went crazy buying my 6 for a buck top ramen I wanted to know just how bad it was lol. I think it's not worth it honestly, thanks for helping me with that. Hey, is it just me or do the cup noodles not even taste half as great as the box? Here's how to make ramen noodles healthy and even yummier! I usually buy the Maruchan Oriental flavor because at least it doesn't have scary meat products; it's actually the only vegetarian one, as far as I'm aware. I cook the noodles in water as usual. If I'm feeling adventurous, I use some chicken or veggie stock instead of the water. Along with the noodles I throw in mushrooms and spinach, or whatever other fresh veggies I have on hand (some will take longer to cook, i.e. carrots or broccoli, so put those in several minutes before the noodles). Then, I add about a quarter (less if I used stock instead of water) of the seasoning packet and throw the rest in the trash. Then, I add a tiny dash of sesame oil (a little goes a long way), a heaping tablespoon of soy sauce, and sriracha to taste (I usually do about a half a teaspoon). Chili is really good for your immune system, and can work wonders if you have a cold!! If you have fresh or ground ginger on hand, a dash of that is really good for you and adds lots of flavor. Easy, delicious, and WAY healthier than the standard! Not really any healthier. The idea that adding veggies (or an egg) to the stuff makes it healthier is false. Addition does not mean subtraction. Also, while using less of the spice pack is a good idea, the main damage comes from the noodles themselves. They are a deep fried refined wheat product. Doesn't get much worse than that. You aren't a "health nut," sorry to burst your bubble. I don't eat Ramen a lot, but I do eat it occasionally and sometimes several days in a row, but only if I can add at least one fried egg to it. The thought of eating it as a 'soup' kind of grosses me out. I always drain almost all the water out, add half the spice packet, butter and the fried and scrambled egg. Recently I've even started adding a dash of sesame oil. I never knew anyone thought it was 'healthy', that's kind of crazy. But I didn't realize one pack is supposed to be TWO servings, that's ridiculous! I love pasta and it's a big part of my diet and will remain that way no matter what those carb shunners say. Ramen is certainly not the best tasting fast food, but it's cheap and gets the job done. Sometimes that's all that's left in the kitchen. I had meals of instant ramen two days in a row. I knew the fat and salt content was high. But it was convenient. I did add fresh vegetables (fresh broccoli and green beans and a couple of frozen pot-stickers). I do love a bowl of fresh Chinese egg noodles with wonton shrimp dumplings topped with roast duck and Chinese broccoli. I also love a bowl of Vietnamese beef pho, rice noodles with all types of beef cuts, with condiments such as mung bean sprouts, Thai basil, cilantro, lime wedges and jalapenos. These are probably more healthful (not by much) than instant ramen that I made. Since this Great Recession started, I have lived away from my family. I have to work and keep the family housed and fed. Kids are in high school and don't want to move. So I have not eaten as well as I should. Visited this site as I was looking for better alternatives. I have just cup noodles for lunch perhaps.. 2 or 3 times a week. In terms of MSG and carcinogenic preservatives, I don't doubt that cup noodles are full of them. And for this reason they should be eaten in moderate amounts. However I disagree that the fat content and calorie count of a cup of cup noodles is a major issue. At least in the UK, the recommended daily calorie intake is 1600 calories AFAIK (adult men and women of all ages). 536 calories for lunch is not an issue at all. Not if the bowl of cereal or piece of fruit you eat in the morning is less than 200 calories. That leaves almost 1000 calories for dinner (knock a hundred or two off if you have biscuits/snacks during the day). 100 grams of potato chips (crisps) contain 480 calories. So a bag of potato chips for lunch every day perfect sense to me too. Never mind that both the bag of potato chips and the instant ramen mostly contain refined carbohydrates, fat and salt. Besides, most people who eat stuff like that for lunch (or any meal) frequently are highly unlikely to be eating healthily for the rest of the day. Noodles are so much more filling/satisfying than potato chips. How can you possibly keep comparing them? Try eating a meal with just potato chips, and another with ramen. You'll get more energy from the pasta, there's a big difference. The salt/msg that comes from the flavor packet can easily be replaced. The saturated fat in the noodles is unfortunate, but manageable for 14 cents. Frequently eating ramen for a meal and switching to a more expensive, healthier alternative for another is completely reasonable. "You might as well eat Twinkies Cheese Doodles instead. Really." Though true to a point, I think your article exaggerates. "You'll get more energy from the pasta, there's a big difference" is the same statement as "the pasta is more fattening". The weight we gain is just the energy in foods we ate but didn't use. I really like how you put that Ramen is a sometimes food, and that you aren't here to vilify it. Comparing it to a bag of chips may be a little generous, though, depending on the size of the bag. A snack-size bag of chips may contain 160 calories, while a full Maruchan Yakisoba Cheddar Cheese flavor meal has 560 calories. In any case, I recently did a reading of that product's ingredient list on YouTube to smooth jazz as a part of a web series I'm doing. If you are into humor, jazz, noodles, and cheese (get it? Cheese? ), then you should totally check it out. I put the direct link to the Yakisoba video as my homepage. And I'll be back to check out more of your posts! I certainly enjoyed the level-headed insight on this Yakisoba one. I have to strongly agree with you about instant noodle soups. I had 2 "Bowl Noodle" spicy chicken soups the other day and got the worst migraine of my life! I was out from work and out from school because my migraine headache was so intense. Earlier that week a friend of mine also had a serious migraine. After hours of me suffering, I called her and asked her if she had any of that instant soup and she replied yes. After that I was absolutely sure the instant soup was what gave us migraines. Those things have so many artificial ingredients in it, you can't even really call it food. I had to go on a detox after that. No more Nong Shim Bowl Noodle soup for me! Yeah, so I eat the brick of ramen noodles every now and again. However, today I had a coupon for $1 off 3 cups of the Nissin Big Cup Noodles. With my three coupons I bought 12 cups total and boy was I looking forward to try out my new ramen noodles. Well, about the forth bite I bit into a piece of cabbage or lettuce so I thought. Something just wasn't right so I took what I thought was cabbage or lettuce out of my mouth and inspected it and it turned out to be a piece of plastic like plastic wrap. Ugh, that so ruined it for me. The cups aren't wrapped in plastic wrap so it came from the manufacture. I could only think if this could get in my cup of noodles, what else could be in my soup. So gross! I thought I would leave my comment here since I stumbled upon your site after doing a search on "piece of plastic in big cup of noodles." I plan on contacting the manufacture and letting them know and I definitely won't be keeping the other 11 cups of soup. I love the nongshim ramyun! But i am well aware of the unhealthy things of it. Its more so the MSG that is unhealthy due to the sodium levels of it. It is not good for yoyr system. I use to eat maruchan. Want to talk about crap? Maruchan is the most disgusting ramyun one can buy. Cause maruchan is found in the "soup" isle in most american markets not the "asian" isle like nogshim. But the thought of it makes me almost puke. Literally. I mostly try to find ramyun with no MSG. Thats a big thing for me. Most asian markets carry them. Nit that its a healthier alternative. The high processed noddles are still processed. But with no MSG it is a better go. Also MSG is known to be more of a addictive addetive more then flavour. So if you crave ramyun its more so you crave the MSG additive then the ramyun itself. Im a big asian food person. I love sushi, many teas and rices. I love eating healthy so my guilt is the ramyun. I do recommend that you do drink hot brewed tea with a bowl of it. It helps with the breaking down of the food, or anyfood for that matter. If you drink soda or something cold, that would just harden the food. Not that it makes it healthier. This is for sure NOT NOT NOT a healthy everyday meal, allthough im guilty of having one a day or other day. I have to cut back. You do realize that the temperature of your drinks mean nothing, as anything you eat or drink, within a few moments, all become the same temperature? 98.6 degrees F. Body temperature. You won't "harden" fats by drinking cold water. I totally agree with this article, it's well done and non-biased. This pretty much reaffirmed my thought over cup ramen noodles, as I've been questioning its healthiness for a while. I ask my friends, who for the majority are asian, if they even have thought about the healthiness of the noodles. Not trying to be discriminatory or racist, but my friends chow down noodles on a daily basis sometimes. I too eat ramen, but I eat it like once every 1-2 weeks which seems reasonable. What really gave me a RED FLAG for the noodles, was when I found out how surprisingly cheap they were. At only 15-25 cents, it makes me feel like as I was eating the worst cheap ingredients that are mass produced and chosen because they are cheapen than other ingredients. 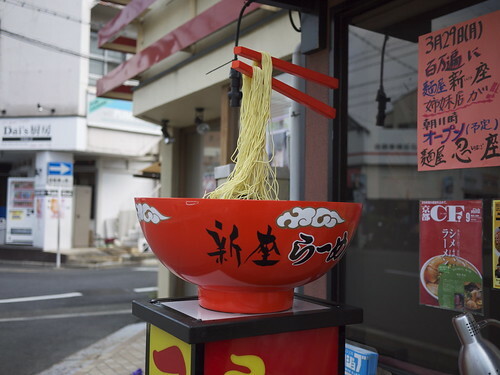 I've seen that moving bowlof noodles just outside of ameyoko in keno! Is it the very same?i have a video of myself eating teriyaki while staring at it, lol. Real ramen is not any better for you, unfortunately! really you feel bad after eating a whole bag of doritos? i tend to feel pleasently satisfied. I love top ramen maruchan brand . I think that the salt content is the most concern when it comes to eating instant ramen noodles forget the calories. If your not lazy then you can burn off the calories you dont want. i ussualy only use half a pack of ramen when i cook a single brick. and if i cook two i use one pack ,if i cook three i use two packs. i am 5'10 and 160 pounds and look good. I eat alot of ramen for finacial reasons and i think the world wouldnt be in so much poverty if everyone just ate more ramen lol. I agree that they are bad for you. It must be that pretty much any instant meal is bad. Such as fast food, or microwave goods. It's also bad to eat too much of something. The same goes for eating too little. I certainly hope people don't eat much of these noodles everyday or frequently. It must be hard to try and balance something that you love to eat. Personally I love Japan. I have become more fond of their foods and culture. I even became more interested in Ramen because of it. It's most likely Japan manufactures it's foods healthier over there, likewise as do other countries with their foods. Either way, these noodles as good as they may taste, shouldn't be consumed so much by people. Great post! Sure, it may be bad for you, but the key is moderation. I don't eat this stuff daily or anything - maybe monthly! Just like bacon and other things, moderation is key. One way you can cut out some of the unhealthy fat is to drain most of the water and put the noodles into the pan (with a dab of olive oil if you want), then add part of the seasoning packet. drain the water into a coffee cup and you will see the oil congeal on the top. THe noodles are much tastier this way, not soupy. Buy the noodles, throw away the nasty flavor pack, and make your own seasonings. Like sweet chili sauce, sriracha, cubed tofu, and some sesame seeds. BAM! Healthy ramen. Japanese instant ramen is waaaay better than what we eat here in the Philippines. If yours in there is bad, ours is evil in salt and you can hardly tell that the soup is beef or chicken or seafood. All are just too salty. My doctor advised me not to eat instant noodles its really bad for the kidney. I agree with using real noodles instead. I pre-cut and portion cabbage leaves, onions and carrots. Then when im hungry for noodles i just cook the noodles and vegetables in a little water after sauteing them then add a little soy sauce. My noodles are fried too but i can significantly cut back on the salt and mysterious flavorings. I LOVE cup noodles!!! And today (2-7-12) i actually looked at the nutrion label and wholly molly is that alot of sodium! I eat them with alot of lemon and tapatio. Ill even eat two in one sitting but now im thinking twice about these noodles, i actually really love the taste. But 1180 mg of sodium is F****** crazy!! Im always looking for healthy alternatives to everything i eat and try to be healthier and this article has definetly helped me THANKS!!! I know how terrible they are for you, but I crave this stuff almost daily. I've managed restricted myself to one a week. It's gotten to the point where when I start to open the package I started to get shakes from excitement. I eat the nongshin korean brand, udon flavour, and add bamboo shoots, tofu meat pocket, king oyster mushroom, watercress, kimchii, fried spam and egg. as disgusting as this is for you (probably 1500 cal, most of it fat), it's kinda become my specialty and everyone asks me to make it for them when they come over. If you ever needed proof that instant ramen isn't good for you there is a wonderful video from the TED conference Fellow Stefano Bardin. Be prepared to be digusted. I agree completely with your assessment! So much of the food we eat, especially in western culture isn't even actual food... we eat products that are made to look and smell like food but really are a concoction of chemicals and fillers. Not all instant noodles are fried in oil. All Instant noodles around the world are not good for health, but the instant noodles of Japanese made are safe enough. It's the best in the world. You should check the instant noodles made in other Asia countries. They are "real" real real "very" very vert "bad" bad bad. If you do some instant noodles experiments at home, you will be able to distinguish how bad the Asian instant noodles is(except Japanese). They contain bad materials. For instance, have you heard someone died because of consistently eating too much instant noodles? By the way, instant noodles and ramen both were invented by Formosan Japanese. No matter you believe in it or not. It's the truth. I did not not know that the noodles were deep fried! It made me think about other noodles I use. What other noodles do you know of that are deep fried? I normally use wheat noodles for stir fries, and now worry that I have been purchasing fried noodles, then re-frying them. Is there a way of knowing which have been air dried and which deep fried? As i had a look at my local supermarket and the packaging does not say. For some reason or other we don't call these ramen in New Zealand. We call all instant noodles "instant noodles" and take no notice at all of which Asian country's cuisine they are supposed to represent. The soup-type may well be bad for you, but even worse (and much more delicious IMO) are the "mee goreng" (which I'm pretty sure is Indonesian for fried noodles) or "Singapore noodles" type. Instead of soup they have multiple little sachets of oil and chili sauce and fried garlic/onions and salty spice mix. Basically instant fried noodles instead of instant noodle soup. SOOOO yummy, very cheap, but horribly calorific and cardio-toxic. But I do agree with you regarding those "indomie" mie goreng, I grew up with it, they are like the things we had on a Saturday afternoon as a treat, not something to have everyday. But my absolute fave is definitely the Nong shim ramyun. Totally addictive. I do try and make it somewhat healthier by adding vegies, but let's be honest that's just to make me feel better for eating it. I try not to eat it, I used to have them once a week, but I've now cut down to once every 3-4 months.